When I first had kids my plans were to limit the number of large kid parties we threw. Then life got rolling and by the time my second child's sixth birthday came around last month, the only question was what kind of party she wanted to throw for her entire class. I was pleased with how the cheetah theme she chose worked out. Animals are fascinating topic, so it's no surprise this science theme shows up over and over. 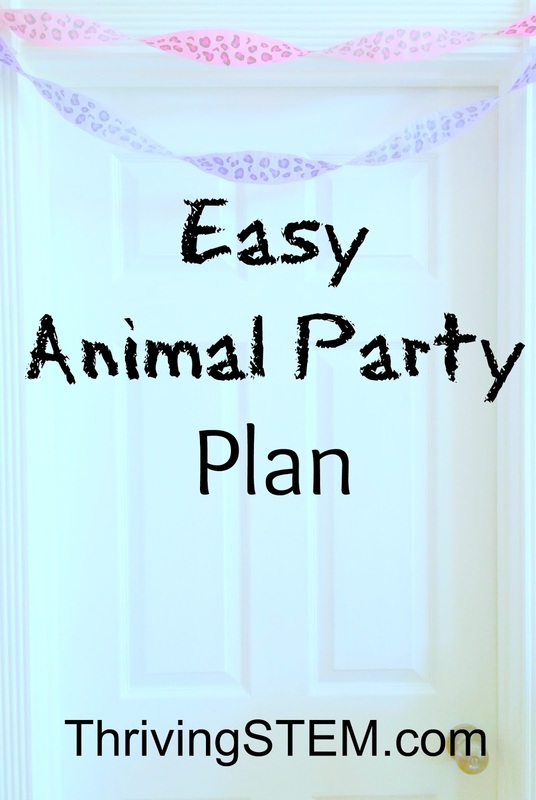 Today I'd like to share a general plan for throwing a fun animal party for a group children 3-7 years old. This particular party wasn't large, probably because of the weather, but we have used this general strategy for up to 20 kids plus parents. As guests arrived they were invited to work on a puzzle or enjoy a Savanah themed sensory bin. Once everyone arrived, we decorated Cheetah cups. Next came a couple of Cheetah themed games. 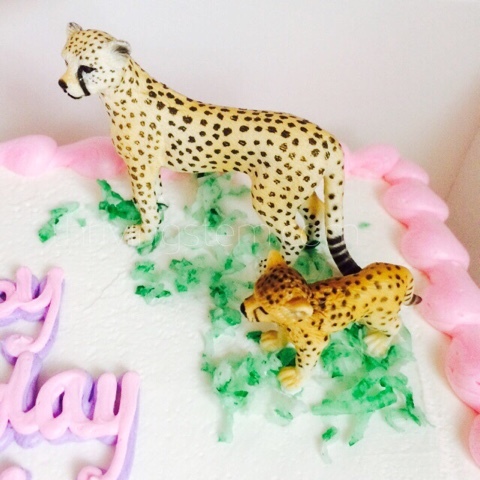 Then we sang "Happy Birthday" as the birthday girl blew out the candles on her Cheetah cake. When the guests' mothers were ready to go, we sent them off with a few animals of their own. Here's a general plan you can use to plan your own animal themed kids party. Finalize the theme. This is a big deal in a child's world, so take your time and discuss. If they have a specific animal in mind (cheetah), try to broaden by family group (big cats) or habitat (savanah), or both. Make sure your child knows this decision is final. In our case most of the invitations were headed to classmates, as per school guidelines. Our experience is that about a third of the class will come, and all or all but one of any other invited friends will show. If your community works like ours, you'll need to estimate your number of guests. Set a date and time. Choosing a non-meal time makes things a little easier. Choosing an afternoon time left us a comfortable window for last minute prep. Hosting a large group of kids is not something to do alone. My husband and I have usually done these parties together. If you don't have a built in party partner, you'll want to find one. My mom helped me with my son's monkey party when my husband was out of the country. You might see if someone would trade services for their child's birthday. 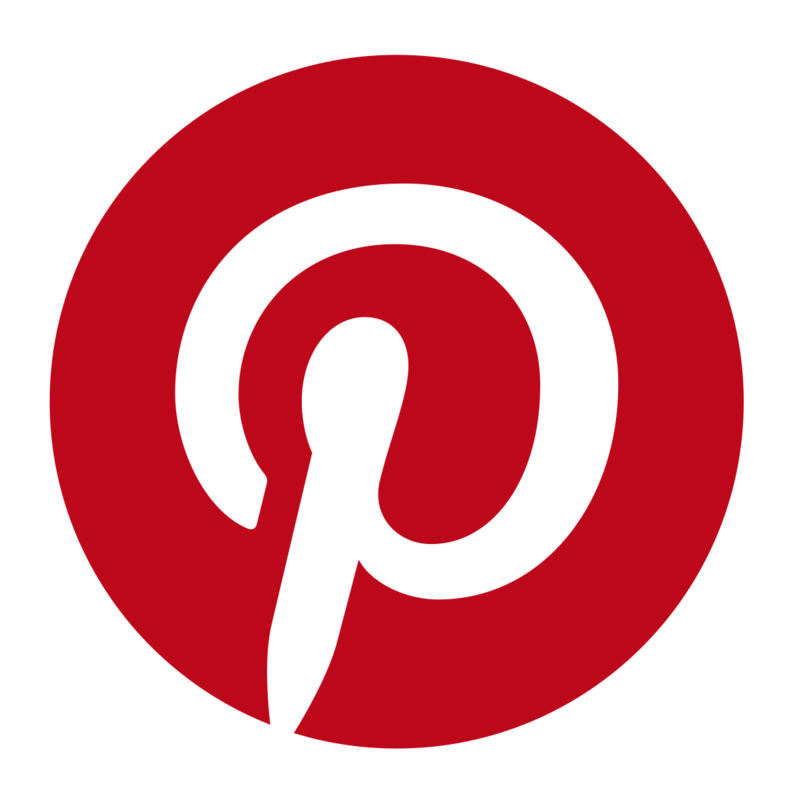 With your theme picked, you can start searching Pinterest for anything that fits your theme. You will especially want these three components. A group of adults will usually be able to entertain themselves with conversation. Kids don't work that way. They'll do best with an appropriate activity available to absorb their energy. I recommend having two activities available when the guests hit the door and through out the party. Animal puzzles are great, and double as another gift. 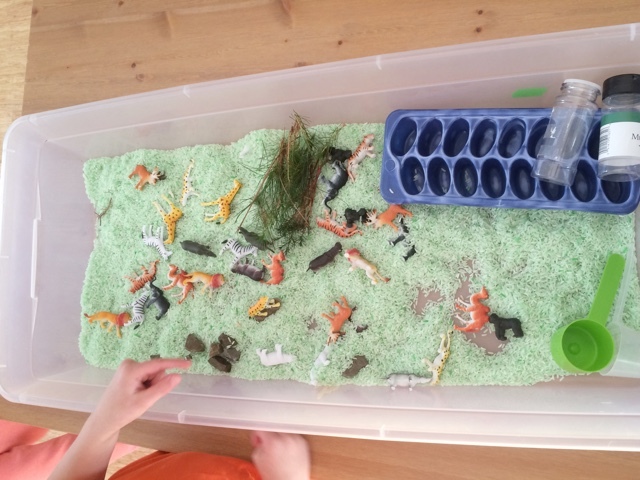 Habitat sensory play like this ocean project is a good open ended activity that can be applied to any animal. There are tons of great animal craft ideas, for example you could make barns for a pony party. I have a whole Pinterest board just for cute animal crafts. Children enjoy being active. You could have them play a prey/predator form of tag, play balloon dodge ball change out the duck and goose for your animals and play duck, duck goose. 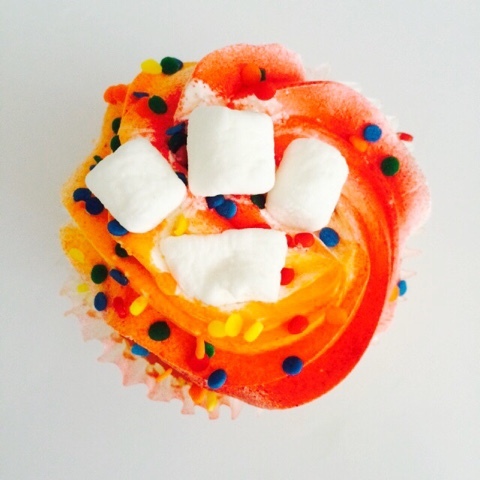 You don't have to do a themed snack, but if you can find something easy and cute, why not? If you want to do favors, make a flexible plan that can be adjusted. Numbers can change drastically at the last moment. At our cheetah party, guests chose Savanah animals from the sensory bin on their way out. Start shopping. Estimate your guest list, and think how you would work in a few late RSVP's. I ordered a puzzle and a set of Cheetah figurines online. The figurines were used to decorate the cake, and have already seen a lot of use in pretend play. I made a quick tour of the party store, craft store and dollar store buying the supplies for our project, sensory bin, and anything Cheetah themed that I could find. I ended up with some candies, ribbon, napkins and streamers. Just a few items make a fun themed look. Send out invitations some time this week. I personalized this free template that I found in Pinterest. Order the cake. I used the number of RSVP's that we had that day and we grabbed some extra cupcakes the day of the party. I really enjoy cake decorating, but for a large group of kids, it's smarter to skip the extra stress. While you're at the store, buy snacks. At home, prepare any craft supplies and materials. Clear the party area of extra clutter. Don't stress about making shine. The kids don't care. Pick up extra snacks and craft materials. Classmate RSVP's often come in at the very last minute. This is where the second adult begins to be helpful. One of you can prepare the house, while the other picks up the cake and last minute supplies. Put a marker outside to help everyone find the house. From here it's all fun until clean up. One adult leads the party while the other plays host: pointing out the restroom, grabbing extra water, and band-aids. You'll notice this is a fairly frugal plan, and we cut the fuss even further by requesting guests not bring gifts. My six-year-old enjoyed her party, and I think her friends did too. I hope so, because she's already working on next year's theme. I am a huge fan of free play stations at birthday parties - the kids love them! We usually pair those with a couple of crafts - my kids aren't big on games, beyond free active games they usually make up with their friends revolving around balloons. It's interesting how kids each have their own preferences. I agree that free play stations and craft tables are a great idea. Some kids really want to do crafts and some don't, so it's nice to have it as an option. And my son just started kindergarten, so this is really useful to know how many of his classmates we can expect to show up at a party - and how to handle favors if you don't really know how many kids are coming! I hope the formula helps! It makes a fun party to include all the last minute RSVP's, but the planning can get a little hectic.